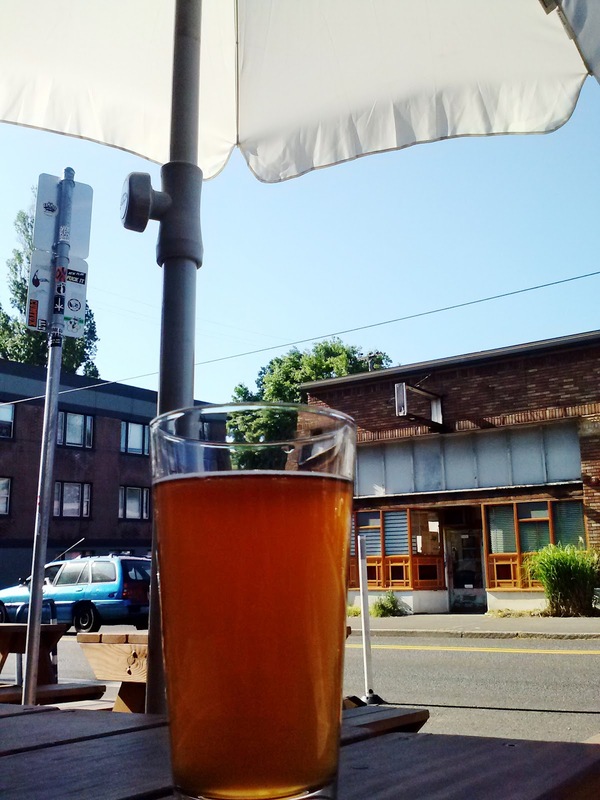 This past weekend, Memorial Day, was the unofficial start to summer and while the weather in Portland has been slow on the uptake, the beer festival scene is moving forward regardless. June kicks off with the third annual Portland Beer Week, which includes the Rye Beer Fest and the Portland Fruit Beer Festival. Rye Beer Fest will celebrate its second year with a new venue, more beers and expanded hours. Held at EastBurn on Friday, June 7th, you can find a full beer list and additional details on their website. 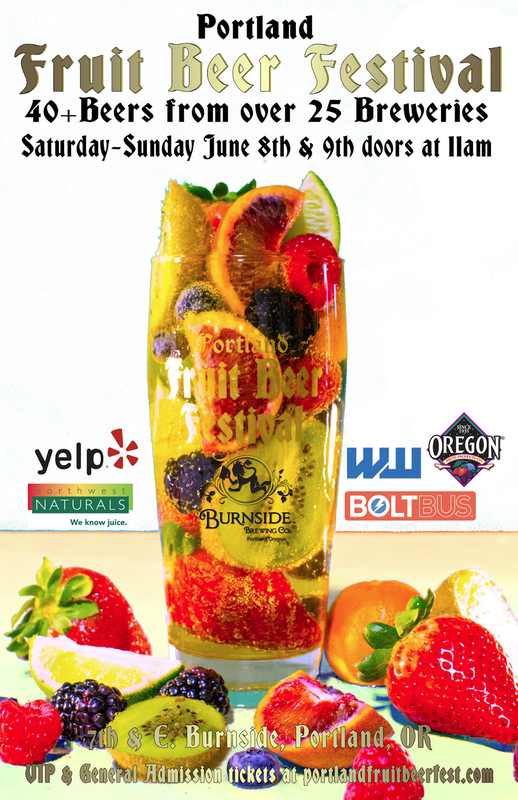 Portland Fruit Beer Festival is in its third year, as a two-day festival taking place at another East Burnside establishment, Burnside Brewing, June 8th and 9th. "Main Stage" beers will be available for most of the festival (although going the first day is your best bet to make sure you don't miss out on anything) while the "Rare & Rotating" beers will be on two to four at a time, being replaced as the kegs are emptied. If you think are fruit beers are fru-fru, just take a look at the beer list and you'll soon find out otherwise. 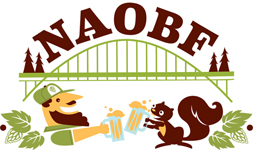 After two festivals focused on beer flavors, the North American Organic Brewers Festival shifts focus and invades Overlook Park in North Portland. The festival, in its ninth year, offers three days filled with organic beer and ciders, live local music, organic food and more. Starting on Friday, June 27th and running through Sunday, June 30th, the festival bridges the gap between the younger, shorter duration festivals that started June and the larger, longer, more established "Big One" in July. That "Big One" is none other than the Orgeon Brewers Festival which comes at a time when summer *should* be in full swing. Now in its 26th (!) year, the festival has expanded to a full five days running Wednesday, July 24th through Sunday, July 28th at Waterfront Park. Over 80 craft beers will be available, hailing from across the U.S., and for the first time those beers will be poured into glass tasting glasses. These replace the plastic mugs that are so prevalent at Oregon festivals, a move which I'm hopeful will continue to spread. These four festivals are just the tip of the iceberg in terms of beer events, especially during Portland Beer Week, but they offer a chance to try a multitude of beers that are often not available elsewhere. So mark your calendars, put your liver on notice and enjoy the bounty of the Portland summer beer scene! 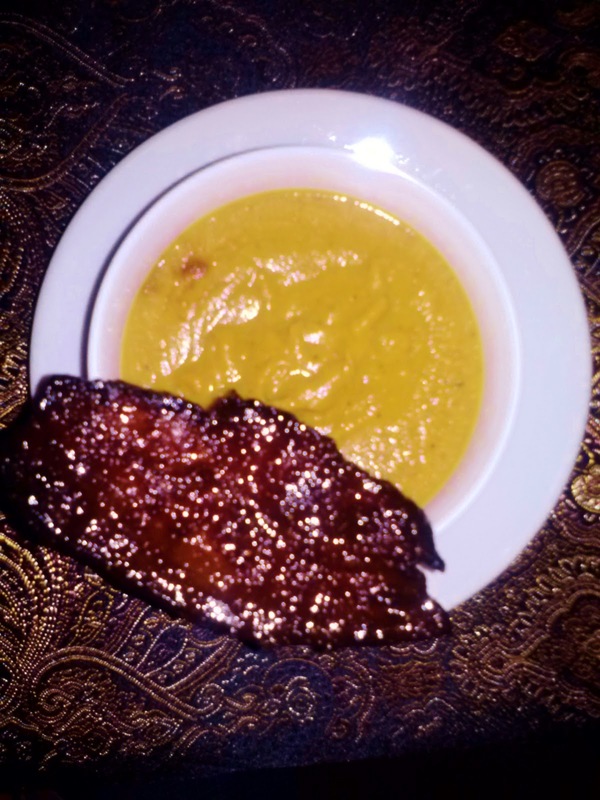 Last week I told you about an Indian fusion dinner I was excited about attending, made even more exciting by the host enthusiastically agreeing to my request to bring beer to pair with the five courses. Emily and Nikol weighed in with suggestions and while I didn't use any of the suggestions directly, their suggestions were a great guide, steering me toward certain styles. Being a huge fan of sours, goses and the like I stuck with the same general ideas given to pair with the beet fritter and the kale salad. 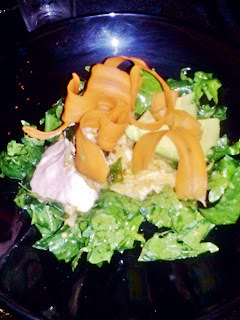 While Maybelle was fine with the kale, it paled in comparison to the Sans Pagaie with the beet fritter. Here the sourness of the beer did a great job of cutting the spiciness of the fritter, sending me in a never ending (well, if my plate and glass had been never ending, too) cycle of fritter, beer, fritter, beer. I also didn't stray too far away from the dessert pairing, which turned out to be bad on one hand and good on the other. The stout was a bit overpowering for the delicately flavored rose panna cota but it was a perfect partner to the basil infused white chocolate. 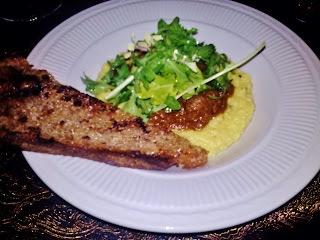 For the lamb and citrus polenta the black rye IPA I chose had a strong enough malt backbone to pair with the heaviest of the courses but provide more of a bite than a red or porter could. It turned out to be my second favorite pairing. That leads to what surprised me by being my favorite pairing - Hopslam, a 10% ABV double IPA with the butternut squash bisque. Both recommendations had been for a much lighter beer but I really wanted to use Hopslam somewhere during the dinner and it turned out that the super thick, spicer-than-I-expected bisque was just the place for it. I wasn't the only one who liked it; in fact, there were people at the table who admitted they didn't enjoy heavily hopped beers but really enjoyed this pairing. The meal would have been stunning on its own and I can't recommend Ruchikala highly enough. She's a delightful person with some serious kitchen skills. The dinner was the highlight of the long, holiday weekend for me. I hope yours was just as good. There are probably a lot of Alan Taylor's out there but the one I'm referring to is a brewer who has recently joined a Portland brewery in Old Town. That brewery is none other than Pints Brewing Company, a combination coffee house and brewery. They opened just over a year ago and as many people know, they've been through a number of brewers. Former Lompoc brewer Zach Beckwith was the first and as of five weeks ago man in charge of the brew kettles became Alan Taylor. Alan's background includes a couple of stints brewing abroad as well as time in California and at Full Sail. His brews are now starting to flow through the tap lines, including his revised version of Seismic IPA. Former incarnations of this IPA were higher in ABV but Alan is working to bring the alcohol content down into a sessionable range. As Alan settles into the position, and the lower level of the brewery that seems to have been designed with a shorter brewer in mind, Pints' small batch brews will likely continue to evolve as he puts his own mark on them. 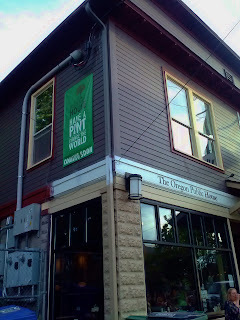 Upon entering, Pints appears a small coffee shop, albeit with a tap list of nine house beers and a guest cider. But a short walk toward the back of the establishment reveals a cozy, larger seating area open to the upper portion of the brewery. The rest of the brewery resides below, a small space but one that still has some room for expansion. While the amount of beer being produced isn't huge, one can find Pints' brews at a few other locations around town including Laughing Planet, Hot Lips Pizza and Life of Riley. If you're interested in meeting Alan and getting a closer look at the brewery you can do so tonight 5:00 - 8:00 pm during the Meet the Brewer event at Pints. In addition to brewery tours and give aways, there will be happy hour pricing on the beer and off menu food pairings throughout the event. EastBurn, known for offering Beer Belly dinners on a regular basis, recently announced a Beer Brunch with Burnside Brewing. Between enjoying the last beer brunch we attended (at Saraveza) and the menu I was stoked to turn the calendar page this week and see that the brunch was just days away. Just as I was ramping up my excitement level I received word that the brunch was being cancelled. Apparently either others have not enjoyed a beer brunch in the past, therefore not realizing that they shouldn't pass this up, or the holiday weekend meant a lot of people had other, conflicting plans. Thankfully my sadness was short lived as I realized that by having what was sure to be a delicious, yet quite filling, brunched removed from my calendar that left me with stomach space available to attend a friend's Indian fusion fair underground supper club. I hadn't been able to attend the last one she offered but knew she made incredible food. As luck would have it she also graciously agreed to my request to bring beer along. Although I know I'll enjoy the included wine and an Indian spice-infused cocktail I'm a beer girl through and through. So now I've something new to be excited about and it's time to peruse the "cellar" to see what might go well with her menu. If you have any beer suggestions please leave a comment as my beer and food pairing abilities are at kindergarten level (at best). If you're interested in attending the dinner (Saturday at 7pm) leave me a note and I'll send you the details. 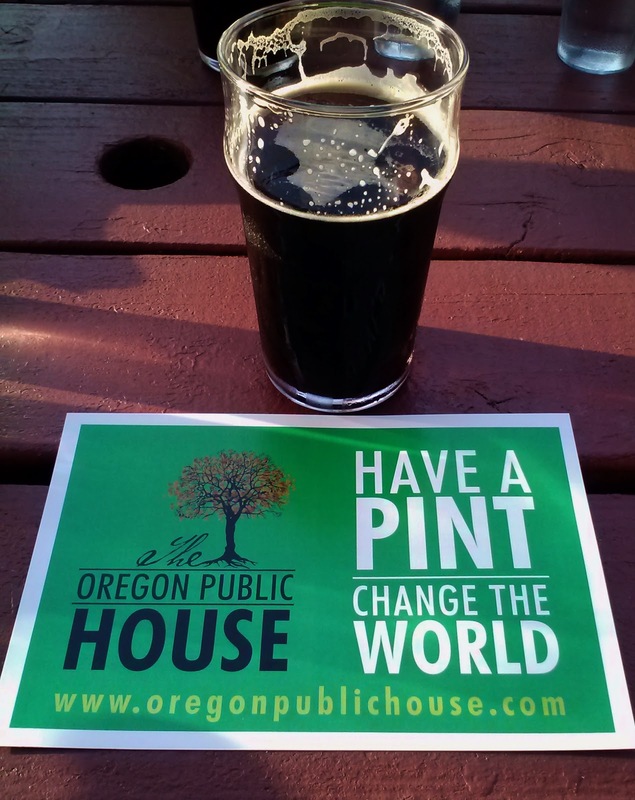 The Oregon Public House is putting a new spin on the pub model and donating 100% of their net profits to charitable organizations. I had heard a little bit about this place and had thought it actually opened a few months ago. However since it wasn't in my usual flight path it was only a passing blip on my very crowded beer radar screen, until this past weekend. 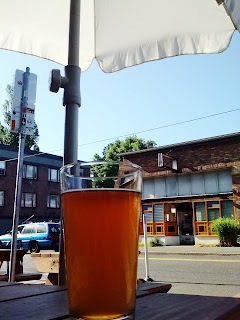 Saturday afternoon we met up with some friends at Breakside Brewery to enjoy the gorgeous day and beers on their patio. 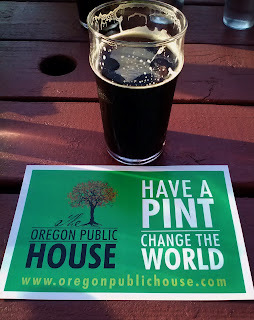 During the course of conversation one friend brought up The Oregon Public House and being that it was just a couple of blocks to the west we thought this might be the perfect opportunity to check it out. Being ever cautious (and not wanting to lose our prime patio seats unnecessarily) I wandered down the block and verified that they were open. Once our glasses were empty our group relocated to their small sidewalk patio area. Their tap list of 12, primarily Oregon brews was full of plenty of great choices and couple in our group also ordered snacks - hummus platter and sweet potato tots - from their menu which offered appetizers, sandwiches and salads. 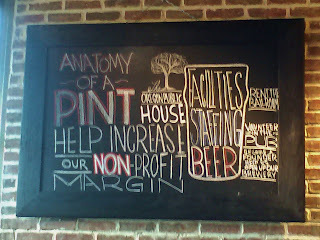 Their third menu (above) listed the current charities the proceeds will benefit. 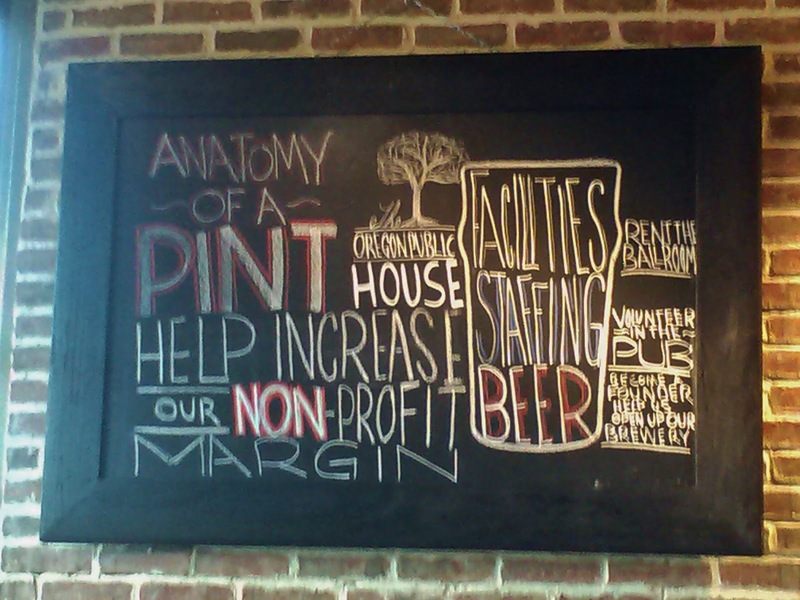 An additional bit of coolness to this donation model is that when you order a pint you have the opportunity to select which charity will receive the approximately $1/pint donation. 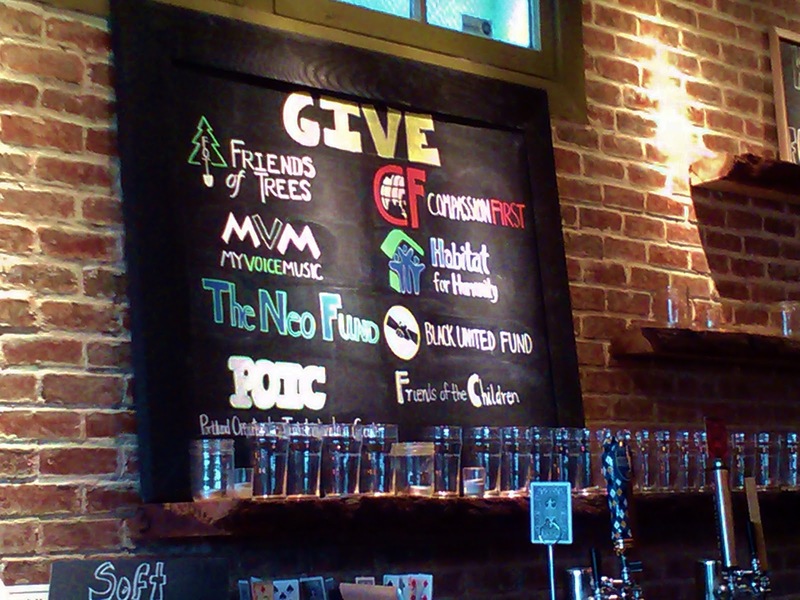 Those interested in making a larger donation can choose from three Founders levels, ranging from $500 to $2,500 and receiving free beer for life by the month, week or day and a personalized pint glass that can be used at each visit. They are currently open Tuesday - Sunday in a soft opening stage with the grand opening coming up this Friday, May 17. I suspect details about the grand opening will be shared via their Facebook and Twitter accounts (two of the five social media accounts they've wisely established). If you're like me and NE Dekum isn't in your usual flight path you may want to like or follow, as appropriate, to stay in the know. 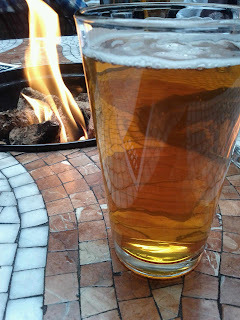 Last night we again took advantage of our new location, this time striking out to the west a few blocks to visit Beer. Open for less than a year, Beer is a beer bar with 10 taps and plenty of bottles to choose from. We had been there a couple of times previously but this was the first time it was nice enough to enjoy the small sidewalk patio. We went to meet up with a couple of friends and there was the extra bonus that Lompoc brewers Brian and Irena were on hand with four of their beers pouring. With it being such a lovely, warm evening I couldn't resist starting out with Saison The Beach even though I'm not much of a Saison fan in general. 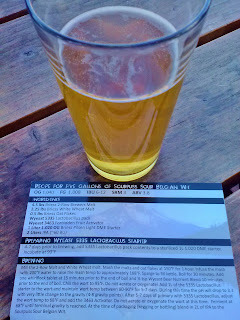 The beer turned out to be fairly mild on the Saison characteristics with the ginger and citrus coming to the forefront, resulting in a beer I really enjoyed. The other three pouring were Electric Sheep IPA, Bourbon Barrel Peach Wheat and Dark Side Porter. 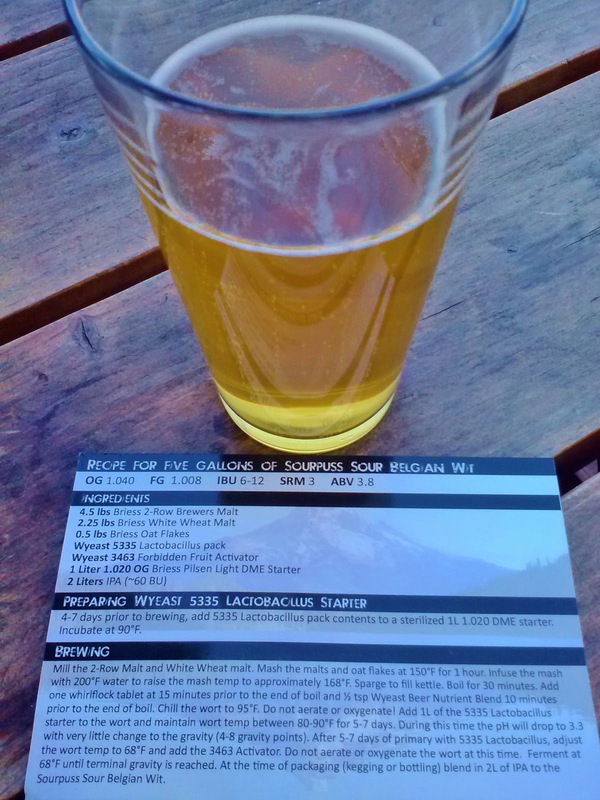 I tried Mag's IPA and was surprised to find that I enjoyed my Saison more. 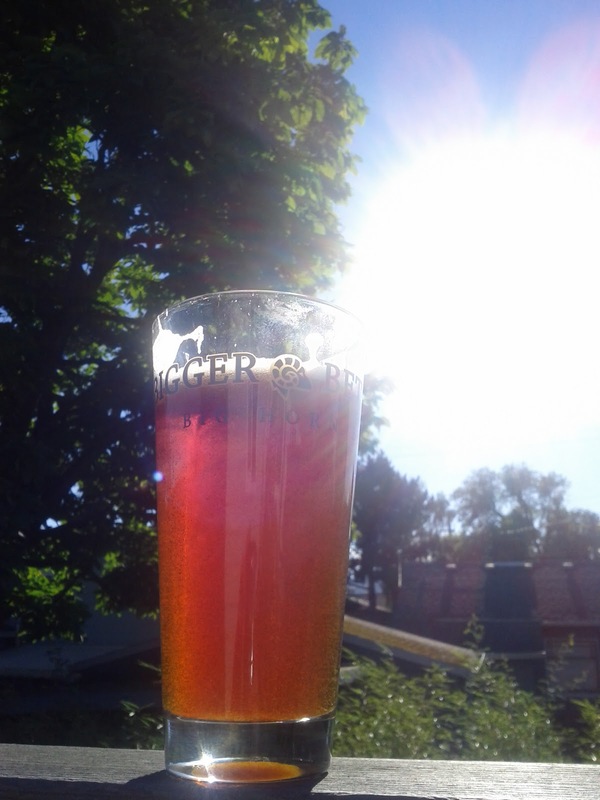 Something about the hops used just didn't do it for me and I would have liked there to have been more carbonation. The Bourbon Barrel Peach Wheat was however quite good. Starting out with a huge bourbon aroma, the flavor was more subdued with a slight tartness in addition to the peach flavor. If there could have been even more tartness and any hint of carbonation it would have really hit it out of the park. 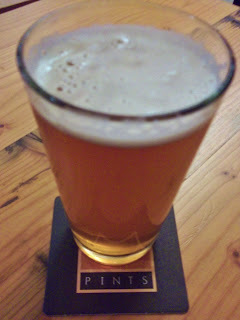 Perhaps Lompoc will brew this again with a couple of tweaks (hint, hint, pretty please). Generally I would have ordered up the porter but with the warm evening surrounding me I just couldn't get behind the style. Instead I followed up on the tart seed that the Bourbon Barrel Peach Wheat had planted and went with Myrtle from The Commons. If you haven't yet checked out Beer, find a time to stop in. While they don't serve food, right next door is Meat Cheese Bread and next to them is a Thai place called Sunee's. We've had food from both before and they each get two thumbs up. Oh, and if you're an equal opportunity drinker there's Enso Winery on the same block. Coalition Brewing on SE Ankeny was one of the first places we found and felt like we could call ours when we moved to Portland three years ago. In the beginning we went there quite frequently. As time progressed, however we kept finding more places, new places kept opening up and before we knew it, we had to look at one another and ask, "How long has it been since we've been to Coalition?" That's a hard thing to admit since Elan, Kylie and the whole staff are so great and welcoming. Then, of course, there's the great beer that they make. We've recently moved so that now we're only 10 blocks from Coalition. It's an easy walk, especially on gorgeous days like we've had recently, and I'm happy to say that I've been twice in the last week. 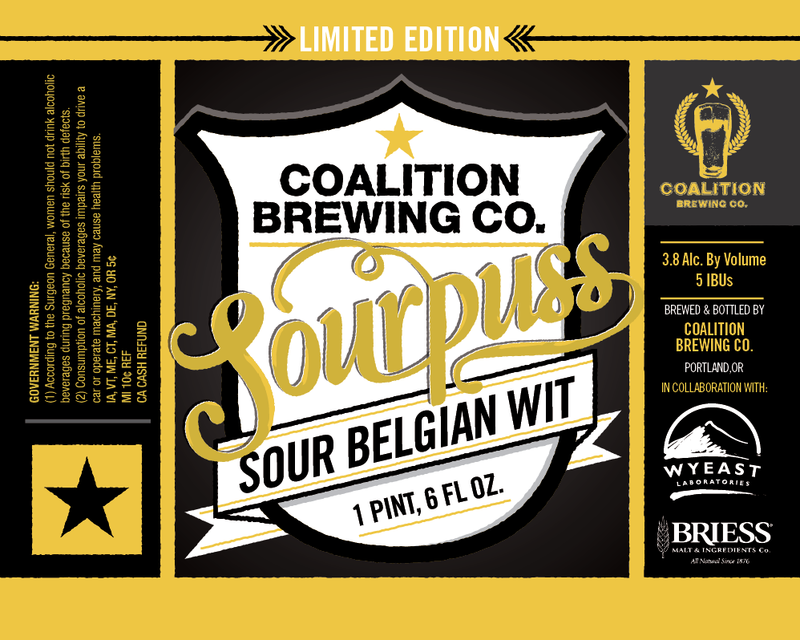 The most recent visit was spurred by the release of their first sour beer, Sourpuss Sour Belgian Wit. Sour beers are a favorite style of mine so I was eager to give it a try. I'm pleased to report that it is an outstanding, drinkable sour. Thankfully it's a sessionable 3.8% ABV because I could hardly put my glass down between sips. If you don't happen to live near Coalition keep your eyes peeled for it in stores. Bottles are currently available at the pub ($9 if I remember correctly) and will soon be showing up at select bottle shops. 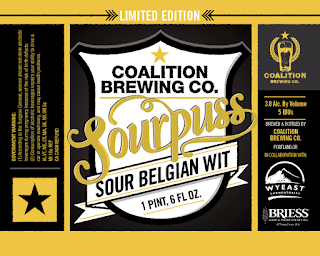 This is a limited edition beer so the labels are a bit of a departure from the look of other Coalition beers. Check out the image below and imprint it in your mind's eye so you can make sure to pick some up when you spy it in the cooler.